Terroir: Chañar Punco is a unique sub-region surrounded by the Quilmes Mountains, located southwest within the Calchaquí Valley. The Calchaquí Valley is Argentina’s best-known wine growing region after Mendoza. At 6500 feet above sea level, this terroir displays unique characteristics. Poor, rocky and calcareous soil combined with the scarce heat load, radiation, in the months prior to harvest, allows the grape to slowly develop its maximum expression. Vineyard orientation runs from North to South allowing moderate winds from the north to improve the microclimate of the canopy. Distilled water is pumped deep from the soil and drip irrigation is used. 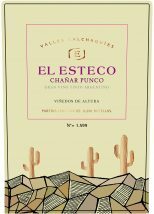 Thanks to its remote, high-altitude terroir, the Chañar Punco possesses great personality and structure, delivering unique characteristics. Harvest is done manually early in the morning, selecting the best rows of the parcel. Pre-fermentative maceration is carried on at 45°F, and native yeasts are used for the alcoholic fermentation. Before malolactic fermentation each variety is racked into new French oak barrels of 225 liters where the fermentation process is carried out and aged for 18 months. The blend is defined after an intense selection of the best 8 barrels. The wine is bottled without stabilization and filtration in order to maintain the essence of the wine. Rich, dark violet in color with a nose of dark chocolate, berry, plum and herb. Explosively rich on the palate with long, structured tannins. "The complexity and intensity are there from the outset with notes of vivid blackcurrants, charcoal, ash, dark plums, creme de cassis, roasted herbs, spices and tons of violets. The palate is pure velvet and fruit with tightly-wound yet immaculately-structured tannins, which are carried to the long, long finish by ever-flowing acidity. Stunning. From 2,000-meter-high vineyard. A blend of malbec, cabernet sauvignon and merlot. Drink in 2022." "Powerful, with hints of elegance to the refined dried raspberry and cherry flavors, supported by fresh acidity and firm tannins. Hot stone and spice details show on the savory finish. Malbec and Cabernet Sauvignon. Drink now through 2022."